This summer, with a grant from the National Endowment for the Humanities, Theatre for a New Audience hosted twenty-three middle and high school educators to participate in the Shakespeare Institute, an in-depth training program in understanding and teaching Shakespeare’s plays language, and themes. 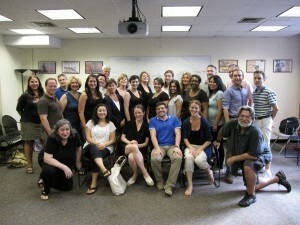 The Institute took place from August 1 thru August 12 at Columbia University. Guided by the theme “Becoming a Man,” the scholars explored Romeo and Juliet, The Taming of the Shrew, and King Henry V.
Morning sessions were led by a two-member team: Professor Molly Murray (Columbia University) and Professor Mario DiGangi (Lehman College CUNY). In these discussions, scholars explored the historical and literary context of Shakespeare’s work, and investigated the language, genre, and themes in the three plays. In the afternoon, our scholars were led by the Theatre’s Teaching Artists Claudia Zelavansky and Krista Apple to explore Shakespeare’s language through performance techniques. By studying, editing, directing and performing selected scenes from each play, scholars developed confidence engaging with and speaking Shakespeare’s poetry. Throughout the two weeks, the scholars—who were selected from over 120 applicants—developed a community where they were able to share in collaborative inquiry and compare best practices. They now return to their schools with a reignited passion for Shakespeare, and an improved ability to share and cultivate that passion in their students. For more about the Theatre’s education programs, please click here.